UK automotive manufacturers turn over ÃÂ£77.5 billion in 2016 Ã¢ÂÂ the highest on record. Workforce productivity at a record high, with 11.8 vehicles produced per employee. Industry calls for certainty to secure future success of the industry. 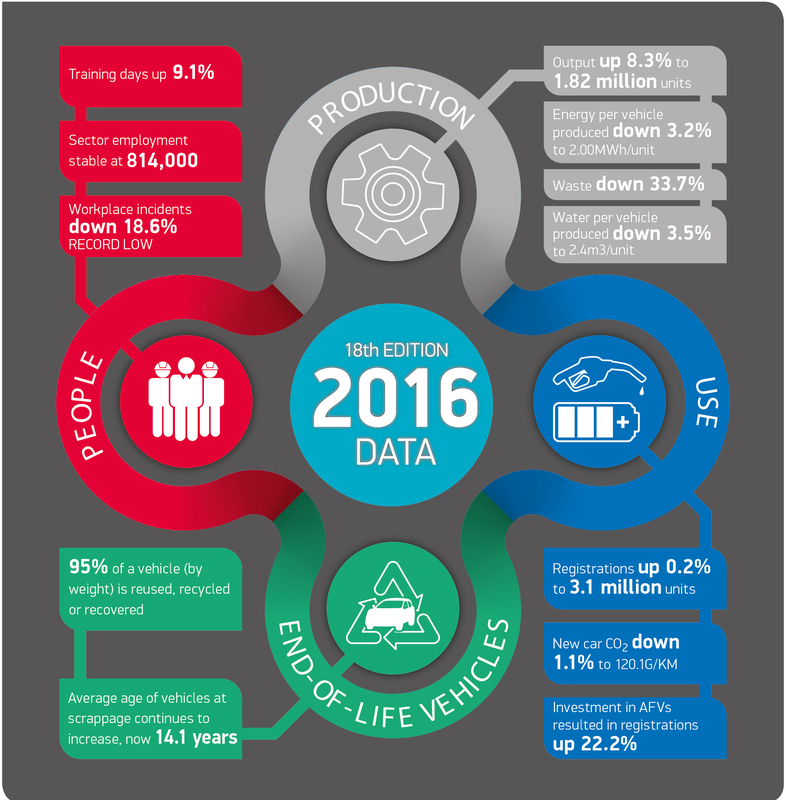 The UK automotive industry continued to advance its sustainability in 2016, making gains in productivity, economic contribution and environmental impact, according to new figures released by SMMT. UK AutomotiveÃ¢ÂÂs 18th annual Sustainability Report reveals the manufacturing sector turned over a record ÃÂ£77.5 billion in 2016, marking a seventh consecutive year of growth, while productivity, production output and vehicle sales also increased. At the same time, the industry improved its environmental impact, with waste to landfill falling to a new low of 0.9% of all waste produced. UK car and commercial vehicle production and new vehicle registration volumes grew to record levels in 2016, up 8.9% and 0.2% respectively.2 Meanwhile, employment in manufacturing remained stable at 169,000 jobs, resulting in productivity reaching a record high of 11.8 vehicles produced for each person employed in the industry. The average manufacturing worker generated more than ÃÂ£130,000 for the British economy, up 9.8% on 2015. The number of livelihoods dependent on the sector as a whole stood at 814,000 across manufacturing, retail, distribution and repair services. The record turnover by UK motor manufacturing represents a 9.0% increase on 2015, with the additional value added to the UK economy rising 7.3% to ÃÂ£21.5 billion. The industry also upped its investment in innovation, with R&D spend reaching ÃÂ£2.75 billion last year, up from ÃÂ£2.5 billion in 2015. TodayÃ¢ÂÂs results demonstrate how UK Automotive is delivering growth across the UK, boosting productivity and improving environmental performance. This has been driven by massive investment, in new models, plants, innovation and one of the worldÃ¢ÂÂs most skilled workforces. However, for UK auto manufacturing to continue to thrive, we need clarity on the future, post Brexit, to encourage ongoing investment and growth. Key to the UK automotive sectorÃ¢ÂÂs continued success is its highly skilled workforce. In addition to increasing productivity, industry has improved the working environment of its employees, demonstrated by the high retention rate, with staff turnover falling to just 5% in 2016 compared with the national average of 16.5%.3 At the same time, investment in skills increased, with the number of daysâ training per employee up 9.1%. In addition, Sustainability Report signatories reported an intake of 870 new apprentices last year, on top of the 800 apprentices that were retained. The sectorÃ¢ÂÂs improved social and economic performance was achieved while simultaneously reducing the environmental impact of its manufacturing processes. In 2016, CO2 emissions per vehicle produced fell by -2.9%, energy use per vehicle fell by -3.2% and water use by -3.5%. Waste to landfill was cut by more than a third (-33.7%) to a new record low of 0.9% of all waste produced, with almost 90% recycled, while manufacturers continued to invest in onsite renewable energy production, in 2016 producing 57.7GHh of energy Ã¢ÂÂ enough to power 14,420 homes. Industry has continued to invest heavily in developing the latest low-emission technology to address the air quality challenge. Alternatively fuelled vehicle (AFV) registrations increased in 2016, up 22.2% to account for 3.3% of the market, making the UK the biggest market for plug-in electric cars in Europe. At the same time, average new car CO2 emissions fell for a 19th year to just 120.1g/km Ã¢ÂÂ 33.6% below levels in 2000. Report signatories reported a fall in energy use, water use and waste to landfill per vehicle produced. 73 million cars and 93,924 commercial vehicles were produced and 2.69 million cars and 430,694 commercial vehicles were registered in the UK in 2016.